A great adventure awaits you in Minecraft. 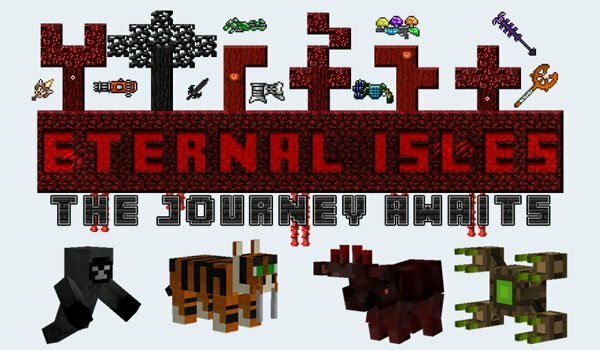 Eternal Isles 1.7.2 is a mod developed by the author of Divine RPG that presents a new world filled with lots of possibilities thanks to the large amount of content added. Some examples are: 75 new mobs 10 bosses, four dimensions, and custom AI (Artificial Intelligence). With all of this and more we can guarantee a lot of entertainment, with lots of new things and places to explore. Along with over 300 new sounds that aim to add a new gaming experience and achieve player immersion. How to install Eternal Isles Mod for Minecraft 1.7.2? Download Minecraft Forge 1.7.2 (concrete version for this mod). New adventures are awaiting to you! i hope u can change ids in the future.